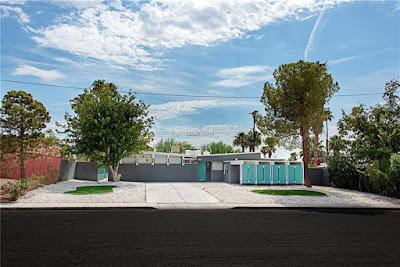 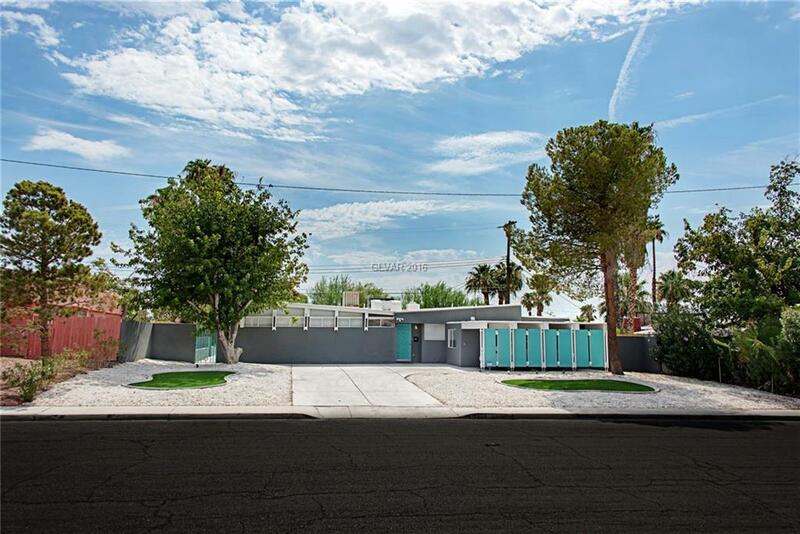 Built in 1963 by Paradise Homes is this butterfly-roofed Palmer & Krisel-designed home for sale in Paradise Palms in Las Vegas, Nevada. 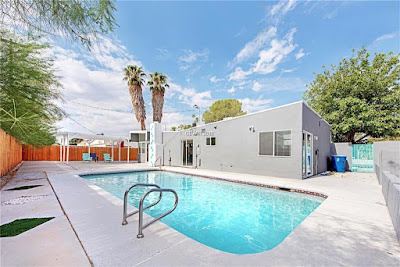 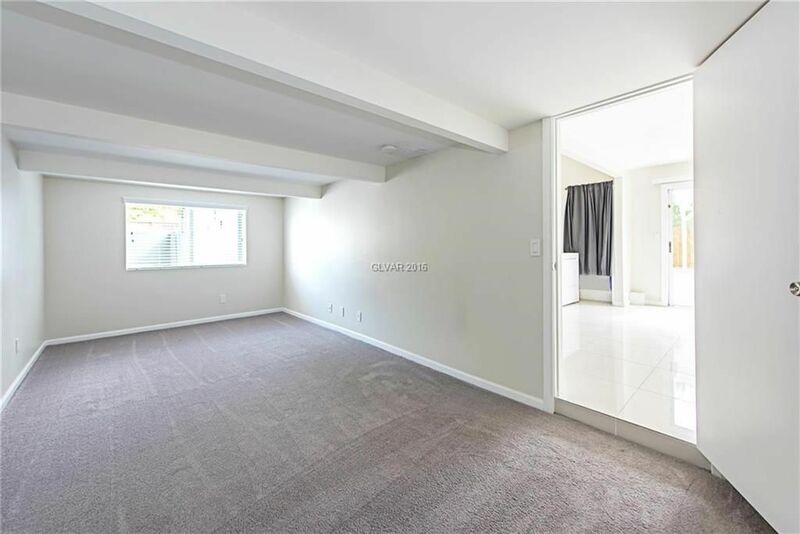 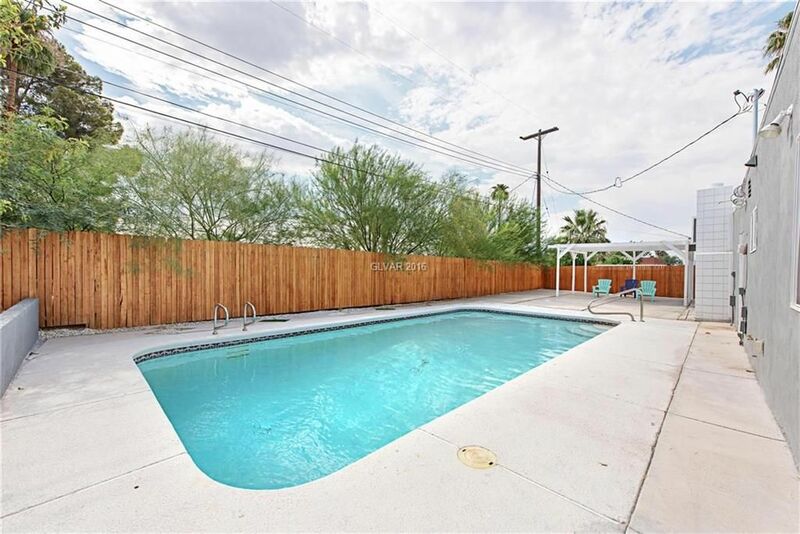 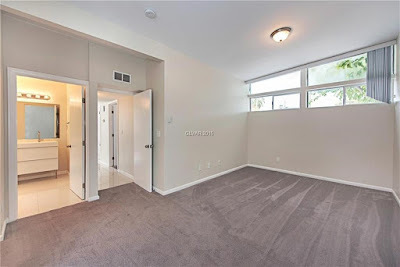 With three bedrooms and two bathrooms, this home has been slightly expanded to 1,643 square feet, sits on an 8,700 square-foot lot with an in-ground pool and carries an asking price of $225,000. 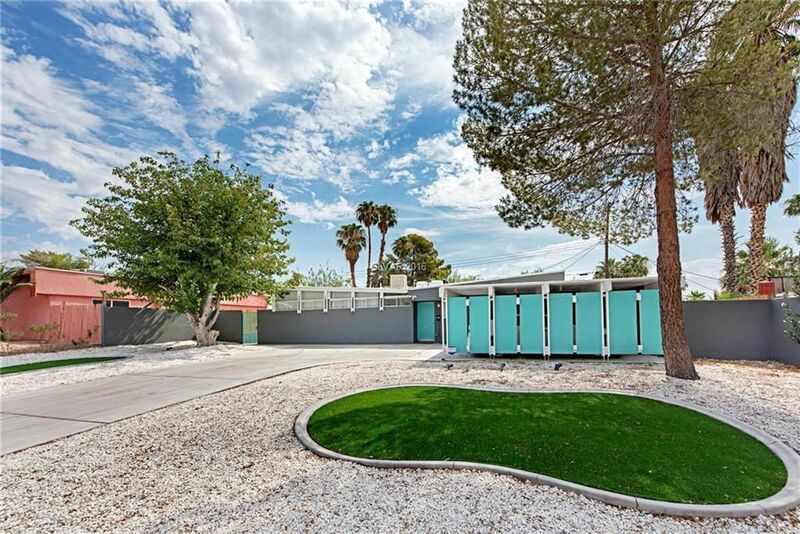 With a white quartz stone front yard complete with a small patch of astroturf, the home has great mid mod curb appeal. 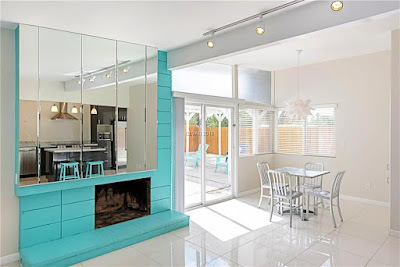 The front of the west-facing home maintains its original lines with the exception of a small addition projecting into one bay of the two-car carport, and a grey and white color scheme with pops of turquoise give this home a fun vibe. Inside, the front-facing kitchen has been opened to the living and dining rooms, which sit at the rear of the home. The living room still maintains its original modernist block fireplace with added mirrors, along with original clerestory windows. 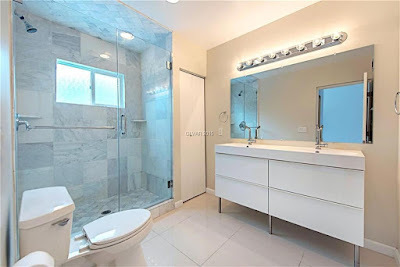 Glossy white porcelain tiles line the living areas of the home, and set a sleek, modern tone. 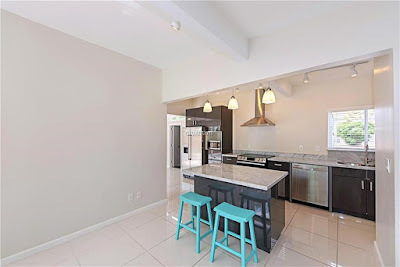 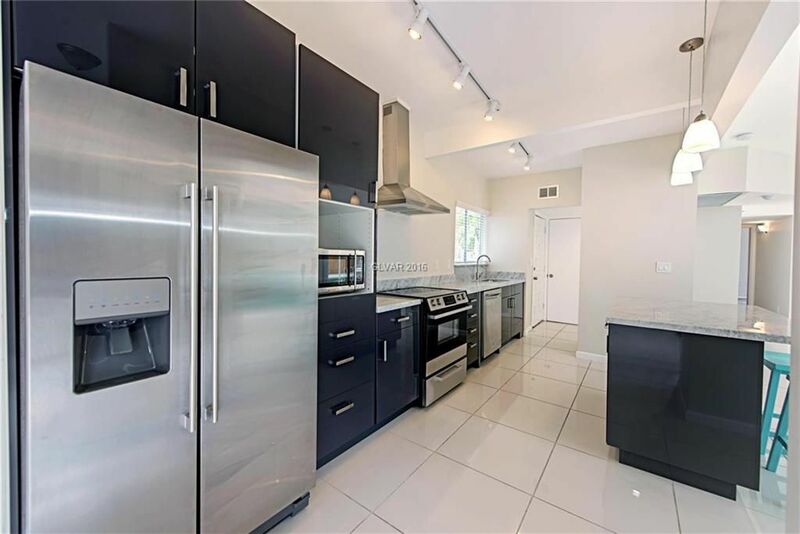 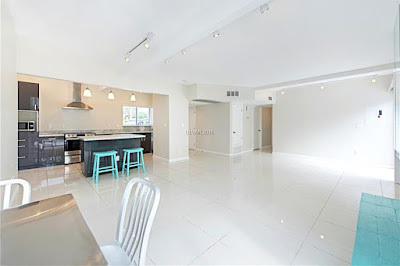 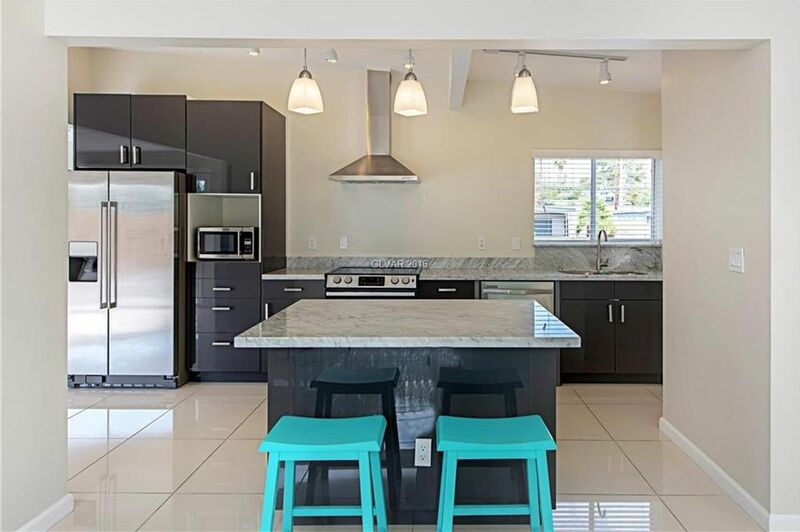 The kitchen has been updated with dark gloss cabinetry, marble counters and stainless steel appliances. A central island allows for easy entertaining between the living room, with small pendant lighted sited above. A small family room addition sits off the kitchen on the south side of the home. 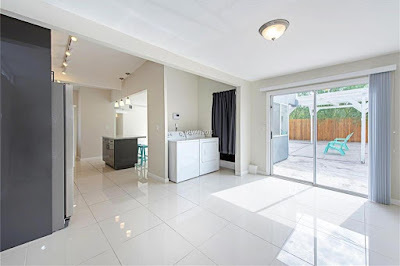 The family room is open to both the kitchen and laundry room, and provides access to the backyard and small sunken den that sits in the second bay of the carport. 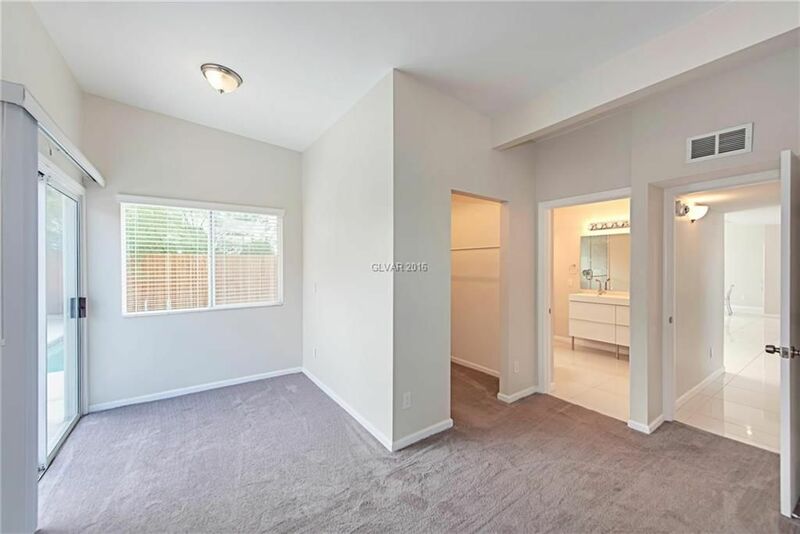 The home was originally built as a 1,200 square foot four-bedroom home, and as seen typically in this model, two of the bedrooms have been combined to form a true master with a walk-in closet. 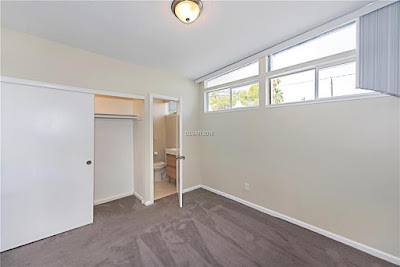 The remaining two bedrooms sit at the front and rear of the home and are relatively diminutive in size, but feature their original windows and clerestories. 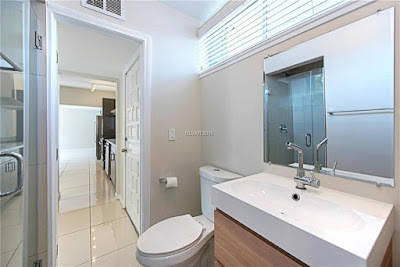 Both bathrooms have been updated with marble surrounds, new fixtures and Ikea vanities. 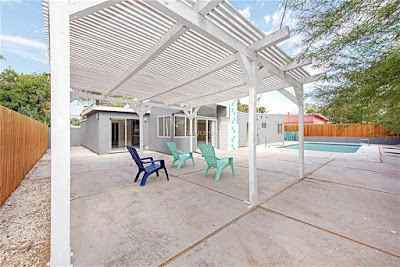 A large, rectangular swimming pool serves as the anchor for the backyard, with a white wooden pergola near the south side of the yard. 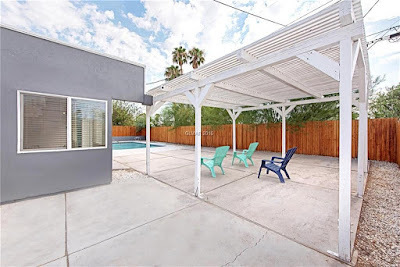 The yard is mostly pavement with no live plants, only a few white rock and astroturf accents, but allows for plenty of room for entertaining and personalization. 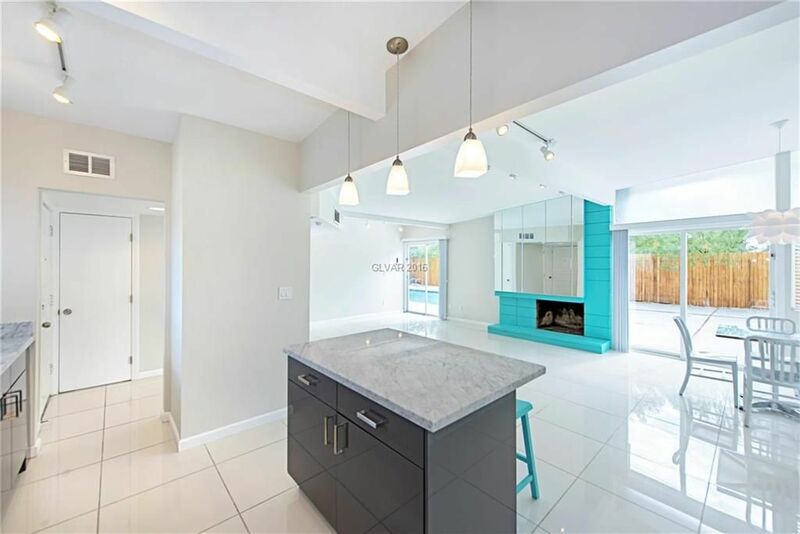 This midmod home is definitely eye catching and move-in ready, and shouldn’t last long at this price.